As some of you know, my stove went kaput and fixing the problem is a chore I’d rather not tackle. I boil water on the one last remaining burner. I heat things in the microwave. Who wants a stove when a brand new kitchen is needed? I’d rather work in the garden or write or vacuum or clean the cat box than bother going through the rigamarole of picking out something I don’t want to spend money on, hiring a contractor and explaining how I so don’t want to get involved, and then supervising installation when there are lots of other cool things to do. And, my kitchen is small, perfect for a low-end sail boat on a weekend excursion in the delta. I’ve been waiting for my ship to come in so I can remodel the whole shootin’ match at once, instead of doing it piece-y. But, the stove, new in 1973, has taken to sparking a bit, which makes houseguests nervous. The knobs have fallen off and the oven door is sprung. It has gotten hard to bake a cake or roast a rump. So, it probably wouldn’t surprise you that reading cookbooks isn’t at the top of my to-do list. Then I get this email about Ruby and I’m come full-stop in front of my sparkin’ stovetop. She sings, she cooks, she rocks—and she’s getting over a serious brain injury. Talk about flame broiling! Here’s what Ruby’s publicist has to say: In Ruby Dee’s Juke Joint Americana Cookbook, chef, chanteuse, and former Seattle restaurateur Ruby Dee Philippa (of Ruby Dee and the Snakehandlers) she offers readers a taste of down-home American cuisine. A Grammy nominated musician, Ruby combines her two loves—music and food—by packaging each book with a full-length Americana CD. The disc features songs by Two Hoots and a Holler, Marti Brom, The Modern Don Juans, Teri Joyce, Elizabeth McQueen, Rockin’ Lloyd Tripp, and even Ruby herself. But it’s not all gravy. Ruby began writing after a devastating scooter accident left her with a brain injury that caused vertigo, trouble speaking, and memory loss, which hindered her ability to recall lyrics onstage. Soon, Ruby turned to writing as a form of cognitive therapy. She began with stories but quickly realized recipes were an even better workout for her mind. ABOUT Ruby: She finally “settled down” as a musician in Austin, Texas, where she lives today. 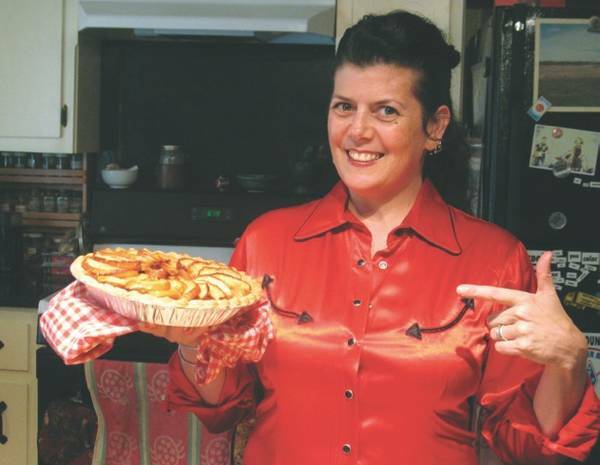 Her book, Ruby’s Juke Joint Americana Cookbook, is a veritable feast of down-home recipes meant to be enjoyed with family and friends. 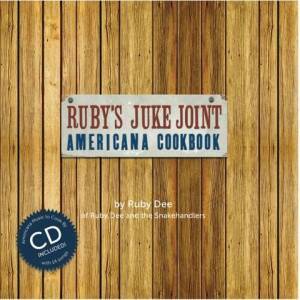 Ruby’s Juke Joint Americana Cookbook is available at www.barnesandnoble.com and www.amazon.com, in hardcover, paperback, and eBook format. It can also be purchased from major and independent bookstores nationwide or from Ruby directly at www.rubysjukejoint.com. 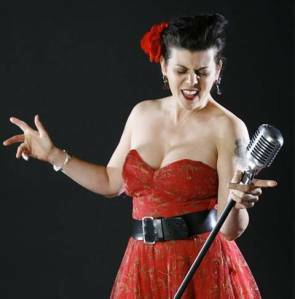 Ruby Dee Philippa is the lead singer of the high-octane roots and rockabilly act Ruby Dee and the Snakehandlers. Raised on Northern California foothill ranches and the cotton and oil fields of the Texas panhandle, Ruby has worked on fishing boats in Alaska, lived in South America, and toured most of the United States. Her travels have inspired her devotion to Americana culture, which celebrates the melting pot heritage of the United States. Previously, Ruby owned three successful restaurants in Seattle, Washington. hanging out for a while! Bring muffins!